Think of the P8H67-i Deluxe as a “Super Mom” because it does an excellent job at keeping everything running smoothly and efficiently! 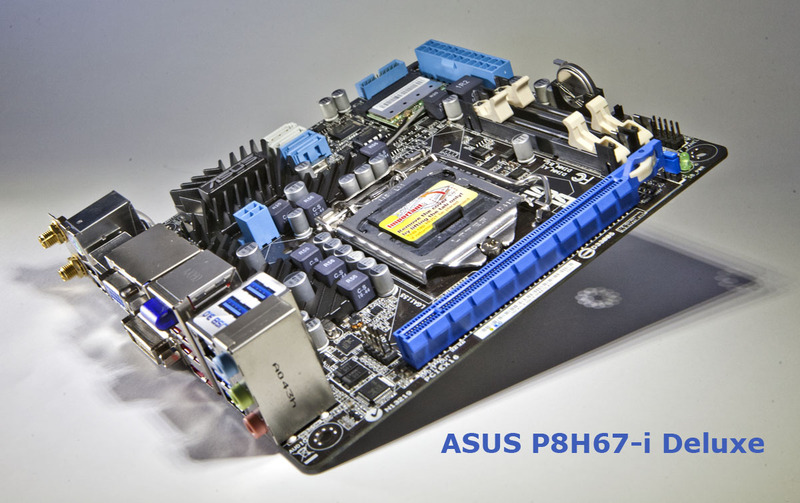 Well if you have been thinking about building your own home theater PC for a while now may be the time to jump in will this great offering from ASUS and their P8H67-i Deluxe motherboard. With more and more of our favorite shows and movies becoming available online the benefit of having a real computer dedicated to handling this content and having the capability of connecting it to the HD display in the living room is becoming more and more appealing. As we all know the motherboard is the core of the system handling and coordinating everything that goes on inside that box. The P8H67-i Deluxe does a very good job and keeping things running smoothly and efficiently and it has everything you will need for a great home theater experience already built into the board. Take note of some of the key features on this board like built in Bluetooth, USB-3.0 ports, built in wireless B/G/N, 2 x SATA 6Gbs ports and HDMI / DVI / VGA support. The board is well built and efficiently arranged, I had no problem fitting it into a small HTPC case. I wish it had one more USB front panel header, to handle a card reader and the front panel USB ports. Once more case manufactures include front panel USB 3.0 ports it won’t be an issue. The only thing this board seems to be missing is Firewire so no connecting that Firewire camcorder to this HTPC. A few other things to note on install are to enable the on-board switch for GPU boost (more on that in a minute) and to make sure you are using at least a 350 watt power supply. The board uses SO-DIMMs regularly found in laptops so keep that in mind when shopping for memory. It will support DDR3 up to 1333 MHz (same as Macbook Pro). I was able to find some Patriot 2 x 4 GB sticks that worked just fine for less than $80.00. Top that off with a socket 1155 (i3/i5/i7) processor and a hard drive and you are ready to go. BIOS: well if you haven’t had a new board for a while the new EFI Bios is completely different yet strangely familiar. Yes that is right, ASUS has dressed up that old DOS looking bios screen. It took just a few moments to get my bearings but it looks great and is very easy to use. Now you can now use a mouse to navigate in the bios configuration (wheel works too!). The EZ mode will work perfectly well for most users but if you need to dig deeper switching over to advanced mode is very easy and you can even make it the default mode. With the H67 chipset it does not allow anything but very minor overclocking on the CPU but the GPU boost allows the board to overclock the integrated Intel HD 3000 graphics that can really help the display performance (I got a 31% boost!). This is all done with a click of a button and without worry of burning up your processor. 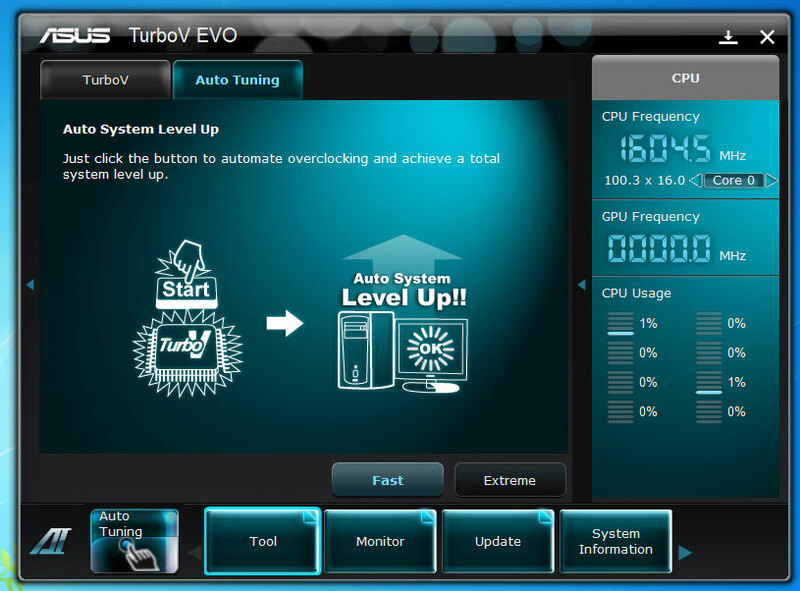 This can all be configured in the BIOS (advanced mode) or with the included ASUS AI Suite application. Wit h the AI suite you can monitor and tweak the board right from the desktop and it is also very easy to use, you just click on auto-tune and then click start and it will take care of the rest … no, really,… it is that easy! Instant no worries performance boost! OS install went well with Windows 7 professional x64. 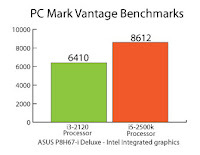 Drivers are readily available on the included driver disk but for the video drivers I found that I got slightly better results from the latest Intel integrated HD 3000 Graphics driver (on Intel’s site) than I did from the ASUS site. My guess is that ASUS just has not updated it to the latest version yet, which I am sure they will eventually do. 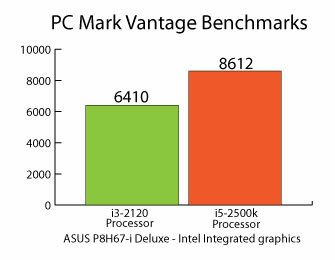 I used an i5 2500k processor and it was more than adequate for HTPC usage. Blu-ray disks played smooth and it was very responsive for your normal day to day work. I was able to get a Windows Experience Index of 6.1 for gaming graphics and 5.8 for graphics with the stock configuration. When I enabled Auto Tune from the AI Suite those scores went up to 6.4 for both of them (out of a possible 7.9)! Game play was improved although it is still no comparison to having a discrete dedicated card installed, frame rates went up about 30% but were still not high enough to play a graphic intensive game. 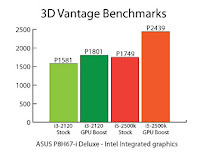 If game play and home theater are your intended use I would recommend installing a dedicated video card to improve your 3D experience and that should also get you support for DirectX 11 (integrated graphics only supports DirectX 9). One little thing I noticed when installing the drivers for the board there was a component called “PCI Simple Controller” that didn’t seem to install correctly even after selecting “ASUS InstALL” (which is supposed to install everything). I went back and installed them one by one an it turns out it was the “Intel Rapid Storage Driver Software”. I am not sure why it didn’t install the first time around. It was a simple fix so no worries. 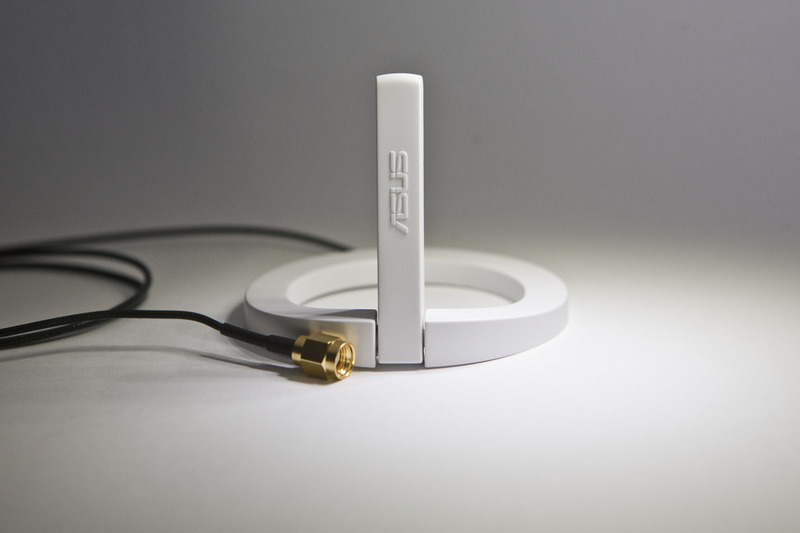 With the integrated Bluetooth dongle, and the ASUS BT GO! application suite you can do a lot with your Bluetooth enabled devices including seven exclusive ASUS functions — Folder Sync, BT Transfer, Personal Manager, Shoot and Send, BT to Net, Music Player and the BT Turbo Remote. The latter is especially unique, as it turns Bluetooth enabled smart phones into a remote control for PC-based media player software. You can even reset and shutdown and Turbo Boost your system from across the room! The built in wireless B/G/N antenna’s seemed to be a little weak on signal reception but once I placed the magnetic antenna’s in a better location they worked very well even through a few walls to the wireless router. ASUS didn’t skimp on the audio on this board. It has the Realtek® ALC892 8-Channel High Definition Audio which sounds great. I am so glad ASUS put in 8 channel audio, it is after all a HTPC board! It includes support for BD Audio Layer Content Protection and DTS surround sensation. It also has jack detection so when you plug into the front panel audio ports it disables the ports on the back allowing for easy headphone usage. It easily connected to a home theater audio receiver with the S/PDIF optical cable port on the back I/O panel. Connecting to a display was very easy as well with the ever popular HDMI connection and the DVI and VGA ports as well. Running a dual monitor configuration was very easy to do and it detected my panel and monitor with no problems. SATA 6G and USB-3.0 are welcomed additions to this board. A fast hard drive or SSD is quickly becoming just as important as selecting a fast CPU in order to keep up with the data throughput demands of today's applications and operating systems. As more USB 3.0 devices become available we will certainly be able to utilize them with this board. 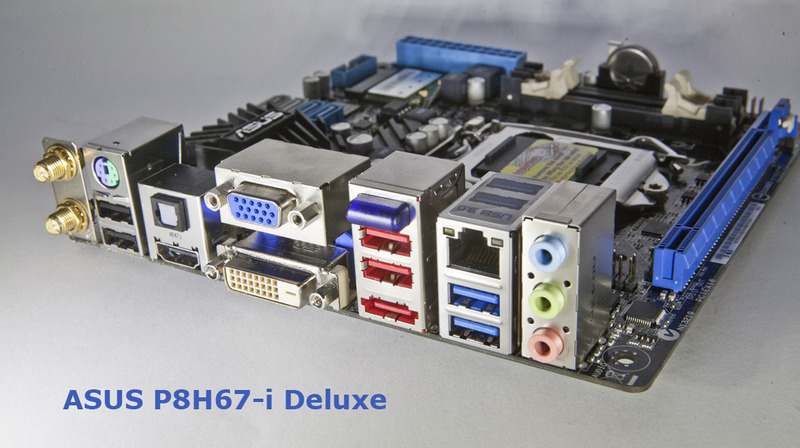 There are five SATA ports available which should be adequate for an HTPC. The two SATA 6G ports are designed for hard drives or SSD’s so remember not to plug in your DVD or Blu-ray drive into one of these ports, use one of the two blue SATA 3G ports instead. There is also an eSATA port on the back panel for connection to an external drive. The ASUS P8H67-i Deluxe is a great foundation for an awesome HTPC; it has everything! There is really nothing of significance holding you back on this board as far as performance is concerned. If you wanted to turn it into a small form factor workstation you easily could by dropping in an i7-2600K and a discrete video card and you are hanging with the big boys … except you have integrated wireless and Bluetooth AND so much more room under your desk! 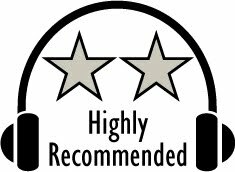 Based on design, features, and performance, it has earned our Highly Recommended Award! For more info and complet e specs, check out their website at www.asus.com.